Gujarati Dal recipes, Gujarati Kadhi Recipe Collection. In any Cuisine, you will find that a meal combines dishes of many consistencies because it is difficult to have a completely dry, crispy or liquid meal. In Gujarati meals too, fluid preparations like dals and kadhis are served to make food easier to ingest. See our Gujarati dal recipe choices. From quick one-dish meals like Dal Dhokli to elaborate preparations, Gujjus cook them all. Come lunchtime and Gujaratis do not like to settle for anything less than a complete meal, which they fondly call the “Dal Bhaat Rotli Shaak”. Try your hands on this famous Gujarati Khatti Meethi Dal made by tempering toovar dal with mooli. The addition of jaggery and tamarind pulp provides the dal with its noteworthy flavors. Another variant of this dal is the Gujarati Toovar Dal, that is simple yet has tongue-tickling flavours. While this is an everyday dal, it takes on a festive hue when ingredients like peanuts and yam are added. For such grand occasions, the Gujarati Dal is boiled over and over again to get the best flavour. Remember that the ideal balance of sweet and sour levels required for the success of this recipe is an art that can be perfected with practice. Apart from the regular chana, toovar and moong dal, reach out to the jar of urad dal to make lip-smacking Gujarati Style Urad Dal with a hint of curd and an array of spices to give a homely taste. Dal dhokli is synonymous to Gujarati pasta. Dhoklis cooked in dal with an array of ingredients making it a sweet-sour delight. This one-pot meal is a Sunday special at most Gujarati homes. Delicacies like Lachko Dal, Mag Ni Dal are dry dal preparations which are extremely easy to make. They can be served as a side-dish or relish it as it is. A bowl of piping hot Osaman complements well with sweet and thick yellow lachko dal is generally served with rice and oodles of ghee. Sukha Moong is a semi-dry sabzi of soaked and boiled moong, enhanced with a myriad of spice powders. Dapkas are deep fried yellow moong dal fritters dipped in kadhi. Dapka kadhi with rotlas, green chillies and garlic chutney is a sumptuous and satiating meal worth a million dollars! Another traditional kadhi is the Gujarati Fajeto made using ripe mangoes. The mango pulp is mixed with curd and then tempered with aromatic ingredients. A sweet and sour preparation from the Bhatia community is this Bhatia Kadhi made with toovar dal water, curd and vegetables like mooli, drumsticks and bhindi. Dals like Gujarati Dal, Lachko Dal, and Kadhis like Bhinda ni Kadhi and Dapka Kadhi are some of the everyday favourites. Discover how to make these as well as other special versions, in this section. 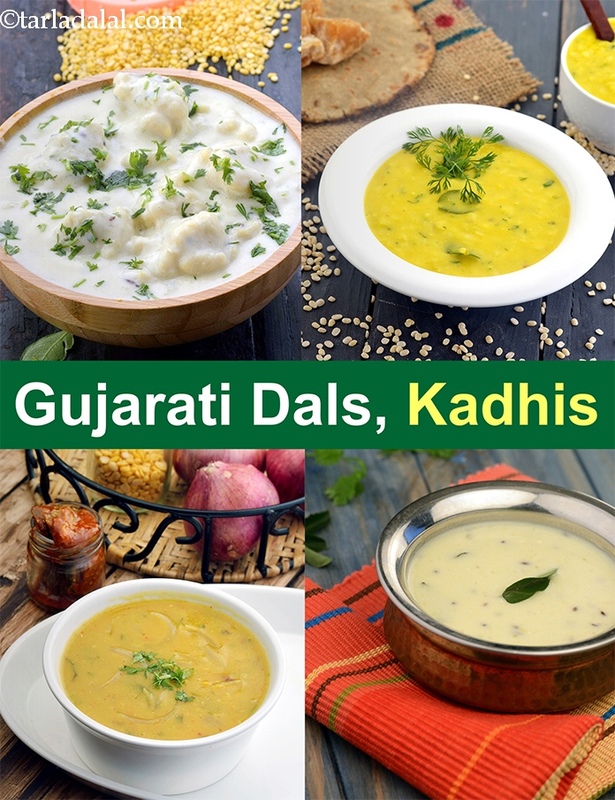 Enjoy our Gujarati Dal recipes, Gujarati Kadhi recipe collection. You will find other Gujarati Recipe articles of interest below. Osaman is a hot, liquid recipe akin to rasam, but not so spicy! the use of toovar dal water imparts a very comforting feel to this recipe. The dal used to make this recipe can later be utilised in other recipes like lachko dal. Enjoy osaman hot, with rice and lachko. Lachko is a feel-good dish in every respect, and usually features along with osaman in a gujarati menu. This sweet and thick yellow dal is generally served with rice as well as oodles of ghee to add to the aroma and flavour. The lachko dal and rice combo is similar to the maharashtrian varan bhaat.